Tangents are weird and wonderful things, drifting away from a main idea to explore another, with often only the slightest of common ground between them. Salon Des Amateurs is one such tangent for Volker Bertelmann. 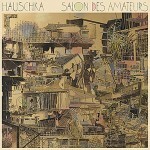 Barely a few months after he unleashed Foreign Landscapes, an album on which he abandoned the solitary prepared piano work he had until then been largely associated with to venture into more orchestral forms, Bertelmann returns with Salon Des Amateurs, an album on which he confronts contemporary classical music with dance references and occasional electronic brushes. At the heart of this is Hauschka’s prepared piano, which is given an additional layer of oddity with the use of loops, which capture and repeat peripheral sounds (a recurring bouncing ping pong ball on Ping for instance), and electronic treatments, which allow Bertelmann to distort his sound further. Recorded in his Düsseldorf, these tracks began life as solo piano pieces, onto which were added other components as the recording process developed. Joining Bertelmann are drummers Samuli Kosminen (múm), and John Convertino (Calexico), with additional contributions from cellist Joe Burns on TwoAM and Girls and violinist Hilary Hahn on TwoAM. Whilst they bring some interesting tones, it is the vast array of sounds and textures that Bertelmann sources from his piano which gives this record its depth and complexity. From regular musical notes, played in conventional patterns and assembled into various hypnotic melodies, to plucked strings and odd noises clustered in rhythmic configurations and ornamental features, Bertelmann creates here a particularly vibrant and contrasted soundtrack. Whilst there are some undeniable similarities with some of his previous releases, especially in the particular approach to melodic forms and the unpredictability resulting of the props used, this is unlike anything he has produced until now. The album opens with plucked strings and electronics arranged in syncopated patterns which are soon brought to life with a recurring piano theme cast against playful brass loops. Later on, the brass section returns, giving TaxiTaxi a rather festive air, while the Reich-esque Tanzbein appears to constantly erupt with new loops as layers are added. The electronic treatment often remains extremely discreet, limited to cleverly assembled loops and occasional sonic florishes; the aforementioned use of a bouncing ping pong ball on Ping adds an interesting counterpoint to the piece’s main rhythmic structure, while the cascading piano lines which develop toward the end of the piece appear blurred with overdubs. On Cube, the sustained notes are at times distorted into dubbey ribbons. The more nuanced structures of Cube, Subconscious or NoSleep hint at dreamier set ups, especially for the latter as the main piano form is dipped into hazy reverbs, but these are never allowed to drift away for long and are brought back in line. What characterizes this album above all is its intense playfulness and colourful outlook. 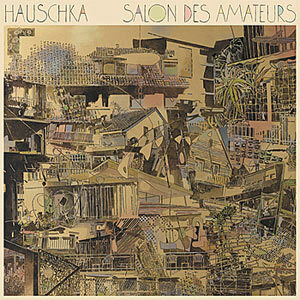 Hauschka’s highly individual style is clearly identifiable here, but, applied in a vastly different fashion to his previous recordings, it takes on a new dimension with these tracks and is likely to prove even more exhilarating when performed live.